Dress up our new Greek Spanakopita Wrap using this delicious recipe. Add Tzatziki sauce, Kalamata olives and more for a taste of the Mediterranean that you can enjoy at home. Heat up wrap according to package instructions. Place the warm wrap on a plate. Carefully cut the wrap in half on a cutting board. Transfer the wrap to a plate and slightly pull the halves apart to reveal the spinach filling. 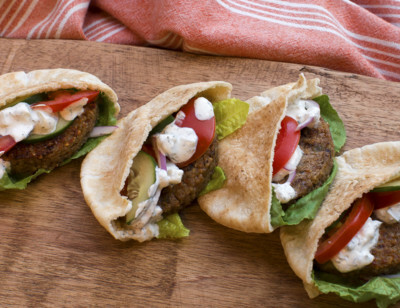 Use a spoon to drizzle the Tzatziki sauce over the center of each half. Gently sprinkle a few diced cucumbers over each half. 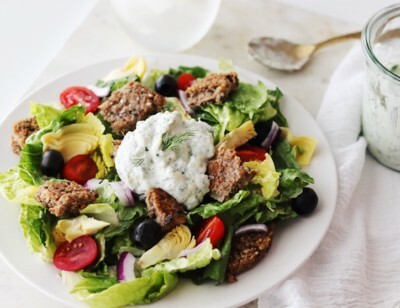 Sprinkle a few Kalamata slices as a nice contrast against the Tzatziki sauce. Add a few sprigs of fresh dill and add to the dip for extra texture and color.